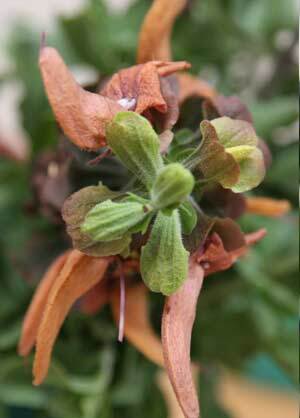 One of the more interesting of the salvia species is Salvia Aurea or ‘Golden Sage’ (syn Salvia africana lutea) is . Foliage is a nice slightly rounded silvery and mid green coloured and in itself is attractive, however the flowers are brown rusty colour with a lime green calyx a real standout when in full flower. Reaching a height of around 1.5, the best flowering time for this evergreen sage is in summer, although it will repeat through until to autumn. Like most slavias care is not difficult, prune lightly at regular intervals to promote new growth. Hard pruning can take place when the flowers stop. This is a very hardy plant and works well in our Mediterranean climates. Full sun is best and a well drained humus rich soil is the best for this one. This is a species that has a tendency to spread, so give it room. It is also suited to growing in containers. Easily propagated from cuttings taken in summer. Best when pruned back hard near the end of winter, this creates a more bushy habit. You can prune back by 1/3 to 1/2 if you wish. Salvia Aurea has perhaps a shorter flowering period than some, but again attractive to birds, easy care and those unusual flowers as well. Spread – Will spread to 1 metre in width. Soil – Well drained and humus rich. Flowers – Golden rust coloured. Flowering period – From summer to autumn.